Professor Robert P Hopkins has been a driving force for the technical development of our campus, and a guiding hand in the development of our academic program. Initially appointed to The Cooper Union for the Advancement of Science and Art in 1972 as Manager of the Computer Center, Hopkins was the college's IT professional. He is now a tenured Associate Professor of Computer Science as well as the Chief Technology Officer. Professor Hopkins was instrumental in developing fundamental courses in computer engineering/computer science at The Cooper Union he continues to work in innovative curriculum development and delivery. 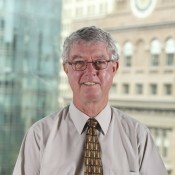 His early work with the UNIX operating system, and his introduction of UNIX into an educational environment, have provided students with the opportunity to learn about operating system design and programming, and they have helped make The Cooper Union a leader in computer engineering, computer science, and information technology. He has also been instrumental in integrating computers into the college's engineering, art, and architecture programs. In his administrative role, Professor Hopkins supervises twelve full-time employees and many student employees across the institution. He and his team are charged with the development and implementation of all information technology for the college; this includes computing, connectivity (voice and data), and institution-wide multimedia support. During his time at Cooper Union, Professor Hopkins supervised the construction of three computer facilities, oversaw the design and implementation of the campus-wide network backbone, and led the design team for the telecommunications system in the dormitory. He has played the pivotal role in the design and implementation of the IT infrastructure for the Cooper Union’s New Academic Building. Professor Hopkins is a long-time leader in a variety of activities that provide engineering and technology to a wide range of audiences. In 1996-97, Professor Hopkins served as a local coordinator for the NASA SAREX program. Using amateur radio as a basis for study, the third grade class of public school #9 in New York City examined the science of space travel and methods of communication; they successfully contacted the Space Shuttle Columbia, and they interviewed crew members about life and science in space. His work with amateur radio and education has been featured on ABC News and National Public Radio, and he served as technical advisor to the authors of the book Hello World, A Life in Ham Radio. He is an advocate for science education in primary and secondary schools, and he has spoken at the National Child Care Coalition Convention on the topic of after-school science enrichment programs. As a Boy Scout Leader and volunteer, Prof. Hopkins has participated in a variety of educational outreach programs. Prof Hopkins is a regular contributor to CQ Amateur Radio. Professor Hopkins' professional interests include programming languages, computer graphics, operating system design, database system design, telecommunications, and the ethics of technology. He is a member of the American Society for Engineering Education (ASEE), the Association for Computing Machinery (ACM), and Tau Beta Pi. He has been an amateur radio operator for over forty years, and he holds an Extra Class license. Prior to joining Cooper Union, Professor Hopkins was the Manager of the Computer Laboratory at Fordham University's Lincoln Center Campus where he was responsible for the implementation, support, and operation of all of Fordham's Lincoln Center computer operations. Professor Hopkins holds a BS (Mathematics/Computer Science) from St. Joseph's College (Indiana) and an MBA from Fordham University.